World Cup 2018 Kaliningrad is one of the hosting cities for the biggest event in soccer—the Fifa World Cup. See more information here. 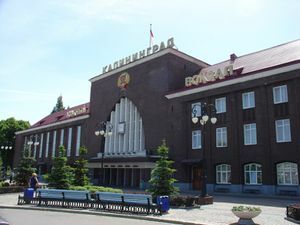 Kaliningrad (Russian: Калинингра́д kah-lee-neen-GHRAHD), is the capital city of Kaliningrad Oblast a Russian exclave. It has about 450,000 inhabitants. 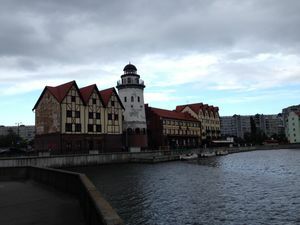 Kaliningrad, also occasionally known by its prior German name of Königsberg is called 'Karaliaučius' in Lithuanian. Lithuanians, cousins to the 'Old Prussians', used to live here. Along with the Polish name (Krolewiec) it is sometimes known as the 'City of the Four Ks: Kaliningrad/Königsberg/Krolewiec/Karaliaučius'. Following WWII it was briefly known as Kyonigsberg (Кёнигсберг), the Russified form of the original German name. The economy is currently booming due to favoured access to the EU for both its inhabitants and goods. 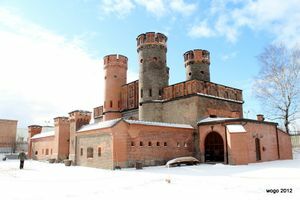 Kaliningrad's history dates back to the 13th century, when it was under the rule of the Teutonic knights, an order of German knights, priests and lay men who sought to expand Christianity through missions and conquests. Known by its German name of Koenigsberg then, the city was the capital of Prussia. 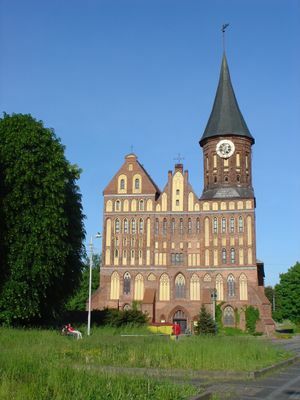 Kaliningrad was a hub for science and culture whizzes from Germany, Poland and Lithuania. It was home to renowned philosopher Immanuel Kant and prominent German writer Ernst Theodor Amadeus Hoffmann. 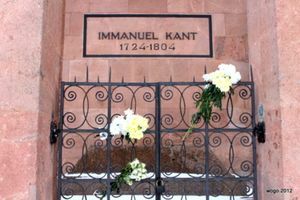 Kant had such pride in his home town that he barely left the place in his lifetime, declaring that he did not need to venture abroad because ships came to tell him stories. Destroyed in World War II and annexed to the USSR in 1945, the region was stripped of its German identity and was named after Mikhail Kalinin, a Russian communist leader. A highly militarised zone during the Soviet era, the area only opened to visitors about 20 years ago. The best time to visit is in summer between June and August, when the temperature is around 20-25°C. Temperatures in autumn range from 10-15°C and the season lasts from September to November. 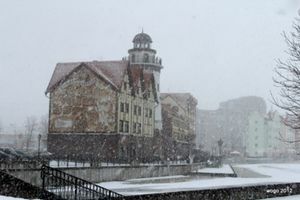 The Kaliningrad winter, which is from December to February, is a much milder winter than Russia, with temperatures typically ranging from 5°C to -11°C. Take along an umbrella, because the weather is unpredictable and windy. 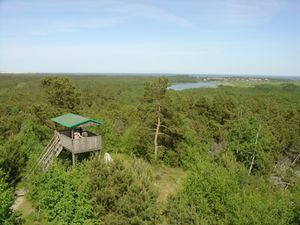 The weather is quite humid too, thanks to its proximity to the Baltic sea. The Baltic sun is mild. As Kaliningrad is an exclave of the Russian Federation, almost all visitors require a Russian visa to enter. If you plan to travel overland between Kaliningrad and other parts of Russia, you will need at least a double-entry visa in order to exit and re-enter Russia. Travelling by air on domestic flights between Kaliningrad and Moscow or St. Petersburg can be done if you hold a single-entry visa. For more information about Russian visas, see the visa section on the Russia page. Special Kaliningrad visa: This scheme is no longer in operation; the short-term visa-on-arrival scheme was withdrawn on January 1, 2017. A full Russian visa is required for entering the oblast. More information special Kaliningrad visa. Kaliningrad Hrabrovo Airport (KGD)  is located 16km from Kaliningrad. A regular bus (144) runs every hour from the terminal to various stops in the city centre for RUB33. A minibus ticket (line #244-Э) costs RUB80 plus RUB20 baggage fee, cards are accepted (June 2017), trip duration is approx. 45 min. Taxi services are also available; two airport-approved companies offer a fixed price of RUB550-600 (depending on the exact place you need to go within city limits, March 2015), that you pay at the desk at the airport. This is a far better choice than any of the people who may approach you at the airport, especially any with a name tag saying Official Taxi in English. If you know the exact address, ordering a cab via mobile apps called Taxi Maxim or Rutaxi (that both have English language option and, by the way, work in a number of other Russian regional centers) can save you roughly 10% in comparison with prices of airport cab services. First of all, be aware that trains leaving from Kaliningrad runs on Moscow time an hour ahead of the local time. Thus a train advertised as leaving at 18:30 actually leaves at 17:30 local time. Comedian Yakov Smirnoff might have said, In Russia, trains leave on time but you get to the station late! Clocks at stations use Moscow time. As of now (May 2011) train connections with central European countries are scarce and regular over-night trains from Berlin and Warsaw have been drastically reduced. However, there will be a nightly train from Berlin taking 17 hours during May-October 2011. Long-distance trains are however still running, if travelling from the east. Departures are daily from Moscow (22h) via Minsk (11h) and Vilnius (6h), and every two days from Saint Petersburg (26h). More irregular services are available from Chelyabinsk (69h) in the Urals and Homel (via Minsk) in Belarus. While trains from Black Sea resort of Sochi (61h, from Adler Train Station) are intended mostly for tourists getting home, it is still possible to book regular tickets on them, except 1-2 trains a week during summer. In summer season regional trains PKP depart from Gdynia via Sopot and Gdansk. Or not, check the website. The road system is extensive in the Kaliningrad region; however, they are not always well-maintained, and sometimes it is hard to get around because of absence of signage indicating directions/destinations (especially in the city. On large roads, signs are displayed in Cyrillic and Roman letters). Driving rules are generally the same as in most European countries, but many do not follow the rules, especially during rush hour in the city. Beware of the traffic police because they like to stop foreigners and often expect bribes. There are two ways to get to Kaliningrad by car - from Poland and from Lithuania, but you should expect delays on the borders (sometimes it can take a couple of hours, and expect up to 5 hours or more on exit, which is why most inhabitants of Kaliningrad prefer the bus which uses a special corridor at the border). The green card for insurance has been valid since beginning of 2009. Bus timetables for international and regional buses (in English). Ecolines bus from Kiel (via Lubeck, Rostock, Berlin, Szczecin and Gdansk) twice a week, from Tallinn (via Parnu, Riga and Siauliai) - twice a day. - Zelenogradsk-Trans, price is RUB700 (Nov 2018) from Kaliningrad to Gdansk. You can buy tickets until 18:00 at the underground level of the bus station, located behind Gdansk's train station, or directly with the driver, if you are more adventurous. If you buy your ticket online, it's highly recommended to print it out, as the absence of paper ticket can be a reason to refuse boarding, according to the Russian passenger transport regulation rules. The bus leaves Gdansk at 06:00, 09:00, 15:00 and 17:00 (as of Nov 2018). Comfortable Volvo coaches or smaller buses (a Turkish-made Otokar). 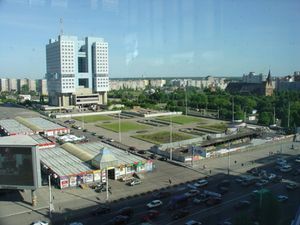 Leaving from Platform 11 in Gdansk, arriving at Avtovokzal (the central bus station, Zheleznodorozhnaya str., 7) in Kaliningrad. - KenigAuto, departures from Gdansk at 15:30 and 21:00, from Kaliningrad to Gdansk at 06:30 and 16:30. Price is also RUB700 (Nov 2018). There is a special offer RUB400 - this price is currently offered from Kaliningrad for early morning outbound bus (Nov 2018). Comfortable coaches with TV in Russian and free coffee, or a 16-seater Mercedes Vario. When the bus is full, however, border transit times are longer because of the number of passengers. Schedules are subject to change, it is advised to consult the company's website at. It leaves from another bus stop in Gdansk, further on the right when you are looking at the bus station from the street (where city buses stop), in Gdansk, and, since September 2016, also arrives at Avtovokzal next to the South Train Station. It's better to buy your ticket in advance, seats are numbered. Bus to/from Vilnius via Kaunas - leaves Vilnius daily at 22:40, the ticket price is 960RUB. Klaipeda is connected to Kaliningrad with two daily buses that run via Nida - at 6:30 and 17:25, a ticket costs 600RUB. There is also a bus that runs to Kaliningrad from Warsaw, it leaves Warszawa Zachodnia bus station at 8:00 Mon, Wed, Thu-Sat, the ticket price is RUR1520. On Tuesdays and Saturdays there is another bus that leaves Warszawa Zachodnia at 13:00, the ticket costs 1200RUB. Other bus destinations include Kiev, Minsk, Grodno. City has bus, minibus, trolleybus, and tram networks. The best way to explore the city is by bus. The public transportation system is very good. Half of the population live in the city, hence it is very well-connected. Fares are kept low, at a flat rate of RUB20 (0.26€ as of 2018) for buses and RUB22 for shared taxis, and the waiting time is short. Tickets on the buses are handed out by the conductors who walk around and take your money, don't try to find them - they will find you. For the bus routes you can download Yandex Transport application. It will show you the bus numbers that are available for your route and will navigate you to the bus stops. The street names in the app are available in both Latin and Cyrillic. Taxis within the city may have meters, but most prefer to negotiate fares in advance. Minimum charge within the city is at least RUB100, even for short distances. The main hailing apps with English interface are Yandex.Taxi, Gett and Rutaxi. Entrance gate of the Fort Friedrichsburg, built in 1852, refurbished in 2012. Now houses the affiliate of World Ocean Museum. Amber Museum (Музей янтаря), Marshal Vasilevsky Square 1 (In the Dohna Tower of the city wall), ☎ Info +7 4012 466-888, excursion booking +7 4012 538-219 ([email protected], fax: +7 4012 466-550). Tu-Su 10:00-19:00. Houses a large number of amber ornaments and jewellery from Yantarny in the wider Kaliningrad region. Adult RUB170, school kid RUB80. Museum of the World Ocean (Музей Мирового океана), Nab. Petra Velikogo 1, ☎ +7 4012 531-744 ([email protected]). W-Su 11:00-18:00. includes two museum ships and one submarine. Kaliningrad Hotel (Гостиница Калининград), Lenin's Ave 81 (Ленинский проспект 81) (Very center of the city), ☎ +7 4012 350-531 ([email protected], fax: +7 4012 536-021). checkin: 14:00; checkout: 12:00. A landmark hotel in the city center, clean and well renovated, within walking distance to most sights. Breakfast buffet is 350 Rubles extra. 3850-4750 Rubles per night; extra bed in a room 1000 Rub. Germany (General Consulate), Leningradskaya street, 4, ☎ +7 4012 920-218 (short-term visas), 920-220 (admission), 920-219 (national visas) ([email protected], fax: +7 4012 920-229). Mon-Thu, 9AM-5PM; Fri 9AM-2PM. Lithuania (General Consulate), Proletarskaya St 133, ☎ +7 4012 957-688, visa questions +7 4012 959-486 ([email protected], fax: +7 4012 956 838). M-Th 08:00-17:00, F 08:00-15:45. Reception of documents M-F 08:30-12:00. Poland (General Consulate), Kashtanovaya Alley, 51, ☎ +7 4012 976-440, visa issues +7 4012 218-741 ([email protected], fax: +7 4012 976-443). Mon-Fri, 9-00AM - 2-00PM. Sweden (General Consulate), Kashtanovaya Alley, 51, ☎ +7 4012 919-414, visa issues +7 4012 218-741, everything else +7 4012 919-414 ([email protected], fax: +7 4012 919-413). Mon-Fri, 9-00AM - 2-00PM. Swedish visa service provided by the Consulate of Poland. Curonian Spit  A nearly 50-km-long spit stretching between Zelenogradsk and the Lithuanian border, separating the Baltic Sea from the Curonian Bay, it includes pine forest, hiking paths (beware of encephalitis-bearing ticks), and beaches. The average height of the sand dunes is 35m, with some reaching to 70m high. Entry fees are 30 rubles per person, plus 200 rubles per car. This page was last edited on 11 November 2018, at 18:08.